We discovered these cranberry beans at the Farmers’ Market recently. Since we had never seen them before and they looked weird, we of course had to try them. But when I did a taste test, I realized that the hulls resembled a cross between the bottom of my running shoe and a celery stalk. So it dawned on me that perhaps these were beans that were meant to be shelled. And lo! look at the beautiful beans in there! And how gloriously speckled and . . . and . . . cranberryish they were when they were all hulled, waiting to be cooked. Thinking it would be better to keep things simple, I decided just to cook them in salted water and then figure out where to go from there. I boiled them for a minute or so, then turned the heat down to low for about 45 minutes until they were tender. My heart went thump-a-thump as I lifted the lid to see the final result. What possibilites for beautiful presentations would reveal themselves! How wonderful it would be to have those little red speckled beauties nestled in a salad–maybe even with dried cranberries! But, as is so often the case, my fond hopes were dashed. Cooked, the beans looked like . 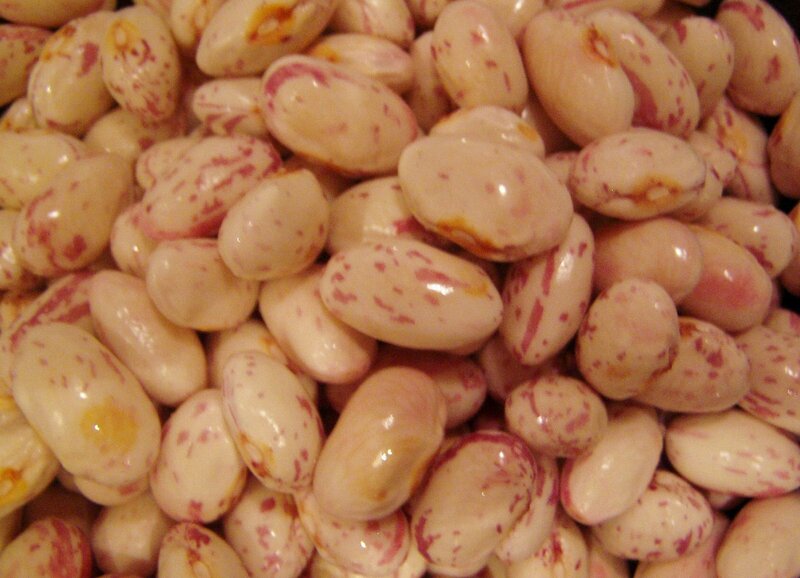 . . navy beans, white beans–every other ordinary bean you’ve ever had. They tasted like . . . beans. If you pinned me down I’d say they’re a cross between a pinto and a lima but certainly not a navy and cranberry (as I’d hoped). I’ll serve them in a salad with olive oil, tuna, and salt. Just like I do with navy beans. This entry was posted in Beans and Lentils. Bookmark the permalink.